Our plastic refuse travels far and wide. The world’s seas have long been littered with trillions of tiny pieces of plastic—and a lot of it is ending up in the Arctic Ocean. The first major survey of the region’s icy waters found that the planet’s northernmost ocean is clogged with about 300 billion pieces of debris from things like plastic bottles, bags, and fishing lines. Carried there from the North Atlantic by a major ocean current, this seaborne junk has few ways to escape the “dead-end” ocean, reports The New York Times. 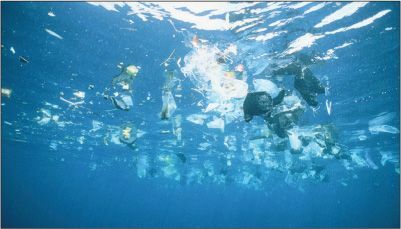 The pollution is different from the “trash patches” that have accumulated in the Pacific and Atlantic oceans; rather than collecting in certain areas, the debris in the Arctic is spreading more evenly throughout the sea. “We don’t fully understand the consequences the plastic is having or will have in our oceans,” says study leader Andrés Cózar Cabañas. “What we do know is that these consequences will be felt at greater scale in an ecosystem like this.” Cabañas says further research is needed to determine whether ocean currents could eventually enable the plastic to work its way out of the region. Sugar-free versions of soda may increase people’s risk of suffering a stroke or developing dementia, reports The Washington Post. Scientists at Boston University studied more than 4,000 people over a 10-year period. They found that those who consumed at least one artificially sweetened drink a day were almost three times more likely to have a stroke or be diagnosed with dementia than those who had one or fewer a week. To the researchers’ surprise, a parallel study of sugary drinks did not find a similar association. Matthew Pase, the study’s lead author, offered several caveats on the findings, most notably that the actual number of diagnoses was very low and that the results showed only correlation, not causation. He also urged people not to see the study as an incentive to switch to regular soda, noting that sugary drinks have been linked to obesity, poor memory, and accelerated brain aging. But Pase did say the findings suggested consumers should be “cautious” about their diet soda intake and switch to water or other unsweetened drinks.